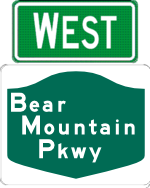 The Bear Mountain State Parkway was intended to be a northern extension of the Bronx River Parkway through northern Westchester County to the Bear Mountain Bridge. 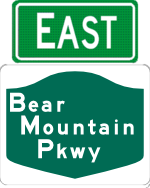 The portion extending the Bronx River Parkway became part of the Taconic State Parkway, with the remaining section renamed the Bear Mountain State Parkway. The parkway exists in two sections, the main one being a bypass of Peekskill, and the other essentially being a long ramp between US 202 and the Taconic. With the completion of Tappan Zee Bridge, traffic crossing the Bear Mountain Bridge decreased, and the parkway was never completed.